I am officially over making footstools. This is the last one, I swear to Glob. I finally got around to making the third of three footstools for my brother’s new house. The first two footstools were for my niece and nephew. This third one is for use in the kitchen. This is very clearly a utility piece. Made from home center Douglas Fir 2×10 (leftover from the Planing Slab project), I opted to be super lazy and left the stock pretty close to original thickness and width (after some rough flattening, straightening and squaring). I just realized that I forgot to mark the pieces to ensure continuous grain in the three main boards, but I imagine it will get a couple of coats of paint regardless. 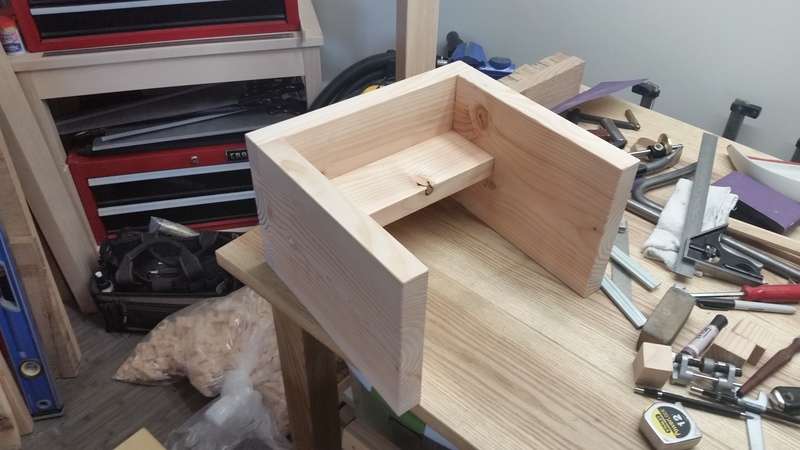 I think that in hardwood, I would have been comfortable with just the two sides and the top. 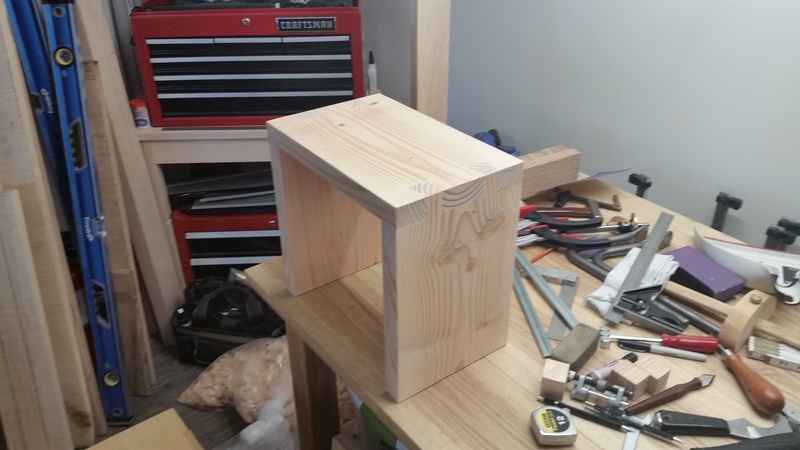 But in something as soft as Douglas Fir, I opted for an additional cross-support, which connects to the sides via mortise and tenon. I did not glue or otherwise attach the cross-support to the underside of the top to allow a tiny bit of flex. Solid as a rock in softwood. Speaking of flex, one nice byproduct of using such a soft wood is that the entire piece has a bit of give throughout. This means that any bit of twist or wobble the piece might have (due to an uneven floor or what have you) vanishes when the weight of a person is applied. With this done, I am now done with footstools, forever. Probably not forever, but certainly for a while.